Rivero had a 1.67 ERA in 2017. 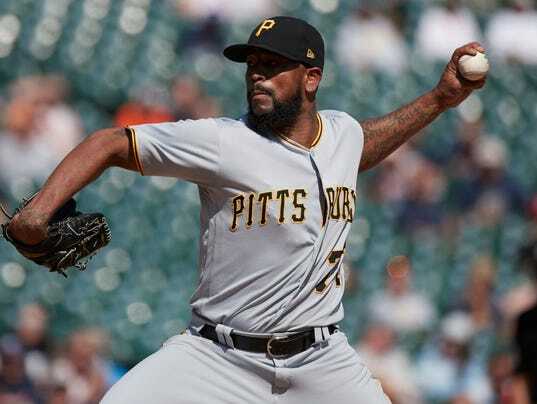 SportsPulse: MLB guru Steve Gardner takes a look at Pittsburgh trading away franchise star Andrew McCutchen (Giants) and ace right-hander Gerrit Cole (Astros), while speculating which domino might be next to fall. PITTSBURGH (AP) — The Pittsburgh Pirates’ rebuilding process will include closer Felipe Rivero. The team has signed the left-handed reliever to a four-year contract that runs through the 2021 season. The deal includes club options for 2022 and 2023. Pittsburgh acquired Rivero in a trade deadline deal with the Washington Nationals in 2016. Rivero took over as Pittsburgh’s closer last May, going 5-3 with a 1.67 ERA and 21 saves with 88 strikeouts in 75 1/3 innings for the Pirates. Sports Business: Is It a Risk for the 49ers to Start Colin Kaepernick? Not for Them.